A bill prohibiting the facilitation of child marriage or a marriage in which one or both spouses are below 18 and declaring it as a criminal act will soon be filed in Congress. In a press conference commemorating the International Day of the Girl, which is celebrated on October 11 every year, the Philippine Legislators’ Committee on Population and Development (PLCPD), Representative Bernadette Herrera-Dy, yoquickuth leaders, and partners of the Creating Spaces to Take Action on Violence against Women and Girls campaign introduced the salient provisions of the proposed bill seeking to prohibit the facilitation of child marriage and declare it a criminal and punishable act under the law. “To provide equal protection for all women and girls, we deem it necessary to introduce a policy that will address child marriage in the Philippines by prohibiting its facilitation and solemnization. We want to ensure that institutions authorizing marriages are made responsible for actions that allow child marriage to happen. Through this policy, key government agencies will also be mandated to provide programs and services to prevent child marriage and respond to the needs of women and girls who have undergone this experience,” said Representative Bernadette Herrera-Dy of Bagong Henerasyon Party-list and Chairwoman of the House of Representatives Committee on Women and Gender Equality, who will file the bill along with other prospective authors in Congress. Despite international instruments such as the United Nations Convention on the Rights of the Child and the Convention on the Elimination of all Forms of Discrimination against Women as well as national legal frameworks such as the Family Code of the Philippines setting the minimum age for marriage at 18, child marriage is still practiced in the Philippines and is usually observed in indigenous cultural communities and Muslim communities. Among Muslim communities, Presidential (PD) 1083 or the Code of Muslim Personal Laws allows marriage at the onset of puberty which, is presumed by PD 1083 to be at 15 years old, but can be younger. Among non-indigenous and non-Muslim communities in the country, marriage is not legally allowed but co-habitation is common as a result of teen pregnancy and is among the primary reasons for dropping out of school for girls. Child marriage is a violation of human rights, and it has negative impacts on the health and development of children, especially girls. According to the United Nations Population Fund, nine out of 10 adolescent births are vulnerable to pregnancy-related complications, which are among the leading causes of death among adolescent girls aged 15 to 19. According to UNICEF, women and girls’ development is hindered by child marriage as married girls are most likely to drop out of school and lose the chance to gain skills and knowledge which will help her gain a good job and earn for herself and her family. The proposed bill prohibiting the facilitation of child marriage seeks to penalize solemnizing officers for officiating, parents or guardians for facilitating or arranging, and adults for contracting marriage where one or both parties are below 18 years old. Moreover, the proposed bill mandates various government agencies such as the Department of Education and the Department of Social Welfare and Development to create or enhance programs that will prevent children from being involved in child marriage and parents from marrying off their children. “We believe in the importance of laws in setting norms and attitude towards respect for the rights of women and children. Let us harmonize our laws to ensure that the rights and the welfare of children, especially girls, are protected and promoted. There should be no child brides and child grooms. 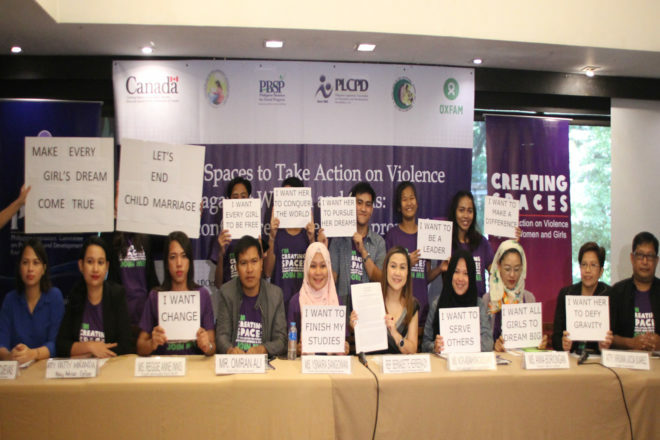 It is in this light that PLCPD endeavors to increase the awareness of national and local legislators, and later on gather their support in the advocacy to end child marriage,” said Mr. Romeo Dongeto, PLCPD’s Executive Director. PLCPD and advocacy partners believe that policy reform is a crucial platform to create spaces for positive change and eventually address child marriage, thus, they are pushing for the filing of the proposed bill prohibiting child marriage in the House of Representatives and Senate this 17th Congress. Other strategies in reducing child marriages and preventing violence against women and girls include capacitating and empowering communities especially women and girls, and strengthening institutions to respond to the needs of those who have experienced violence. PLCPD, Oxfam, Philippine Business for Social Progress, and local partners in the Autonomous Region in Muslim Mindanao, Al-Mujadilah Development Foundation based in Lanao del Sur and United Youth of the Philippines-Women based in Maguindanao are part of the campaign called “Creating Spaces to Take Action on Violence Against Women and Girls.” The campaign aims to contribute to addressing child marriage as a form of violence against women and girls through creating spaces for prevention so that key community stakeholders can identify, take responsibility for and nurture positive gender equitable attitudes and norms; creating spaces for response so that women and girl survivors have access to safe spaces in relation to support services and empowering economic opportunities; and creating spaces for sustainability so that civil society organizations, especially women’s rights organizations, other institutions and networks can connect, reflect, share, learn and adapt their approaches to reducing violence and the prevalence of child, early and forced marriage.